The information about introducing solids online is a mess! Are you about to start introducing complementary foods to your baby? Are you looking for accurate information but don't know if you can trust your online searches? Don't have time to read a whole book? What if there was one place you could get all the latest information about introducing complementary foods to your baby? What if the information was gathered and presented by a registered dietitian and backed by the latest peer-reviewed scientific articles? What if this information was presented in short bite-sized videos that can be watched from any device at any time of day? Welcome to the BLW online course. The one place online where you can get all the most accurate and up-to-date information about introducing complementary foods to your baby. Designed by a registered dietitian and mom with experience. 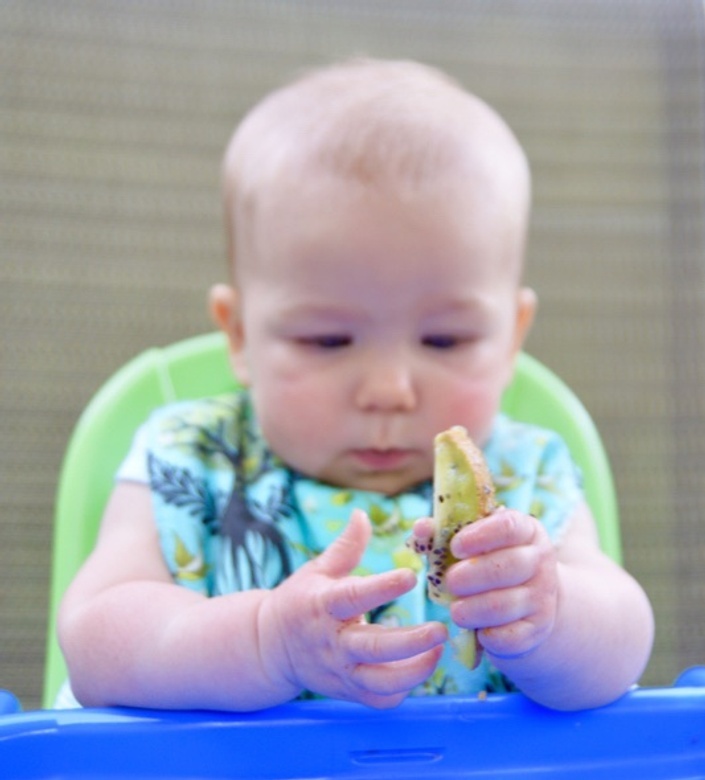 With BLW, babies feed themselves with whole foods starting at 6 months old. They skip the puree stage all together. Babies continue with their milk feeds as previously and they eat foods like omelettes, fresh fruit and soft meatballs. Learn how to get started with BLW and get all your questions answered by signing up for this online course. BLW is contraindicated for babies at risk of dysphagia, such as babies who have an anatomic disorder (cleft palate, tongue tie), a neurological disorder (developmental delay, hypotonia, oral hypotonia) or a genetic disorder. Follow-up by a health professional (doctor, pediatric registered dietitian) is necessary for babies at risk of anemia such as babies born prematurely, babies with low birth weight (less than 3000 g), worries related to growth, babies born to an anemic mother, baby for whom cow's milk was introduced early and/or a vegan baby. Jessica Coll is a registered dietitian (RD), lactation consultant (IBCLC) and mom of 2 kids who did BLW. She is the creator of the oh-so-popular BLW workshops given to thousands of parents across North America. Jessica believes in the power of eating real foods, starting from their first bite. The information found in this course is not intended to treat, diagnose or prevent disease and is provided solely for educational purposes. Always seek medical advice from the child's physician with any questions regarding a medical condition.